We invite you to explore India - the Land with infinite beauty ! Whether you soar high into Himalayas or peer under the ruins of the Ancient monuments dotting the landscape of India, you will cherish the experience long after your visit ! This India Travel Guide on Jog Falls is free from any commercial interest! This site is dedicated to promote India - the vast subcontinent, its glorious past, magnificent landscape and its infinite variety. This major tourist attraction in Karnataka is also the highest waterfalls in India at an altitude of 1500 meters on the Western Ghats Mountains, inviting a host of visitors to India. Known also as Gerusoppe Falls and Gersoppa Falls and Jogada Gundi, Jog falls is ideally located on the River Sharavathi, in Shimoga district of Karnataka. Jog Falls is just about 30 km away from Sagara and 104 km from Shimoga and almost 379 km from Bangalore. Gushing down from an awesome height of 253 meters, Jog Falls originates at Ambuthirtha in Thirthahalli taluk, flowing north of the Western Ghats and joining the Arabian Sea at Honavar. Perhaps the most famous in India, Jog Falls stands 829 feet tall and can stretch almost 2000 feet in width at peak flow. Interestingly, the Falls divide into four distinct segments, and the name of each segment reflects its own personality - the Raja, the Roarer, the Rocket and the Rani or the White lady. The mist around the Falls lends a magical setting to the viewer. Perhaps the right time to visit this glorious water fall is during the monsoon season when you can get to experience the splendor of the Jog falls amidst dense clouds. The Tunga Anicut Dam is situated about 15km from Shimoga and this dam was built across the river Tungabadra. Boat trips around this lake are popular. The Lion-Tiger Reserve is good for safari located nearly 12 km from Shimoga towards Jog Falls. Honnemaradu is situated on the back waters of River Sharavathi and this island is formed with the backwaters of Lingamarkki Dam which is famous for water sports. Sagara is a small town in the district of Shimoga and it houses several ancient temples, a delight for the traveler to watch. Siddapura lies on the Western Ghats and provides a captivating view of Sahyadri mountain ranges. Sirsi is a small town in Uttara Kannada district located amidst emerald green forests and several waterfalls. A black marble idol of Lord Ganesha is worshipped every year at Sirsi with much fanfare. By air, the nearest airport is Bangalore. Those who wish to travel by rail can take the train to Sagara from Bangalore and go to the Jog by bus. 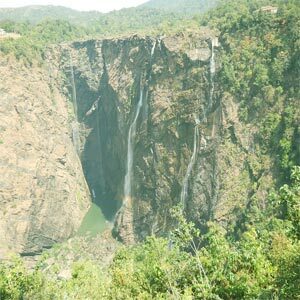 Road travelers can directly reach Jog Falls by boarding buses that ply from Bangalore and alternatively from Bangalore to Sagara, from where a local bus to Jog is also available. There are a number of hotels in Jog Falls offering remarkable blend of tradition and modern cuisines. Sharayati tourist home, Tunga tourist home, Inspection Bungalow, Jog Falls Guest House are some of the places to stay. Trekking is preferred by many, who trek to the bottom of the Falls and witness the breathtaking memorable experience with them. There are also many view points to watch the Jog from different angles. Honnemaradu, near the Falls is a backwater place famous for water sports adventure and bird watching. In recent years, the Falls is seen as a source of electricity production in an economical manner. The Linganamakki Dam which is several miles upstream draws heavily of the seasonal rains that help Jog Falls to retain their glorious show.